“A master craftsman, Lovecraft brings compelling visions of nightmarish fear, invisible worlds and the demons of the unconscious. If one author truly represents the very best in American literary horror, it is H.P. Lovecraft.”—John Carpenter, Director of In the Mouth of Madness, Halloween, and Christine. THE DOOM THAT CAME TO SARNATH—Hate, genocide, and a deadly curse. THE NAMELESS CITY—Death lies beneath the shifting sands, in a story linking the Dream Cycle with the legendary Cthulhu Mythos. THE CATS OF ULTHAR—In Ulthar, no man may kill a cat...and woe to anyone who tries. THE DREAM-QUEST OF UNKNOWN KADATH—The epic nightmare adventure with tendrils stretching through the entire Dream Cycle. The Dream Cycle of H.P. 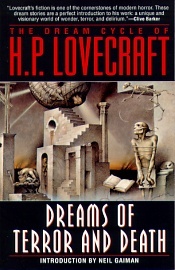 Lovecraft: Dreams of Terror and Death. By H.P. Lovecraft. New York, NY: Ballantine Books; 1995; ISBN 0-345-38421-0; Paperback.